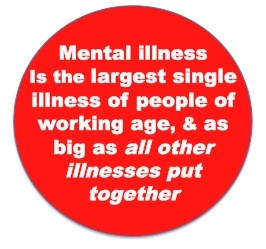 To set the scale in perspective – the World Health Organisation’s evidence based scale says that mental illness is the largest single illness of people of working age, and as big as all other illnesses put together… as big as back pain, cancer, diabetes – everything – all physical conditions put together…. Extraordinary. 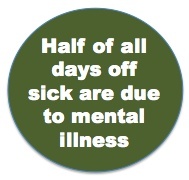 Half of all days off sick are due to mental illness. Richard Layard of the London School of Economics tells us that he attended the DAVOS ‘Workplace and Wellbeing Alliance’ meeting in January of 2013, which was a 90 minute seminar by and for sixty of the worlds largest and most enlightened companies – yet it was only in the 85th minute that mental health was mentioned! All of the time had gone to discussing cancer and aging and diabetes and lung conditions and so on. Nobody wanted to discuss mental health, but the cost is huge. On all levels. Again, extraordinary. 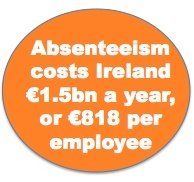 Another issue currently being measured in group studies is ‘presenteeism’ – which is when the employee is in work, not absent, but is underperforming (and/or negatively performing and affecting others) as their mind is elsewhere with mental health issues. Th is is thought to be a large number and climbing. We now have solutions to help tackle the problem of absenteeism and presenteeism by teaching trainees the theory and application of modern psychotherapy (Cognitive Behavioural Therapy) – as recommended by the London School of Economics and Kings College London among others. The workshops … enjoyable training in how to understand and strengthen emotional health – no ‘group therapy’, no stigma – just very practical new coping skills for everyday life. This is classic personal development training with a modern edge. It’s a fun and fascinating ‘learning by discovery’ experiential workshop that teaches the ‘new science of thinking and feeling and behaving‘ using the CBT psycho-educational model. The CBTandFeelingGood evaluation sheets are overwhelmingly and enthusiastically positive. Trainees report a positive change in attitude and thinking and behaviour, and stronger emotional health and wellbeing… Call to request sample evaluations / testimonials. – well it really doesn’t matter – everybody can benefit from it. Learning to understand and take care of our emotional health is as important as taking care of our physical or nutritional health – maybe more important! This learning also teaches us better understanding and acceptance of other people and their behaviours, and how to communicate more effectively. In short, CBT teaches us new skills in self management, new coping skills, that help us stay calm and feel good and have constructive and productive behaviours no matter what life throws at us. NOTE: CBT & Feeling Good approved Training Programmes and Trainers were accredited and approved for placement on the FAS and Enterprise Ireland National Register of Trainers. (Registration # 903680.) In full compliance with the Qualifications (Education and Training) Act 1999. Fully accredited and insured. CBT explains what is happening around life’s stressors and anxiety – it teaches you to ‘think about thinking, and gives you practical methods and techniques to change dysfunctional and unhealthy thinking and behaviours… it will give you a mental toolbox to effectively become your own therapist. CBT and Feeling Good train individuals and employee groups in how to use CBT to develop new smart coping skills to deal with life stress and anxiety – promoting psychological health and wellbeing through education.